This article provides critical insight into the way customer priorities change during a contract life cycle. Aligning your performance to these changing priorities is the key to winning the recompete. Many Government customers have a lifecycle approach to managing contracts. That means their priorities change at different points during the contract. This can be particularly true of your Government contact manager. Are your delivery priorities aligned to theirs? If not, you could find that, at end of contract you don’t have the good relationship ou had hoped for. And that could damage your recompete. 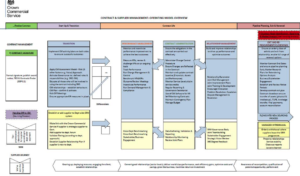 This diagram was from a UK Central Government contracting website. However, the processes are similar to those in use at US federal agencies. Some elements that are relevant are discussed below. The customer has different priorities during start up / transition, during ongoing contract management, and during renewal / recompetition. During initial transition, the customer is focusing on establishing the KPI model, risks, assessment, governance and expected behaviors for the rest of the contract. How can you help them set up to establish a positive outcome for the rest of the contract? During the delivery phase, they are focusing on managing contract performance, contract administration, and relationship building (with you and other stakeholders). The customer manager is tasked with constantly looking for improvements in performance and outcomes, working jointly with you. Do you know what your customer’s priorities are during contract delivery? And do you have the approach, processes, and appropriately skilled and incentivized managers in place to work with your customer to achieve their aims of improving the contract as it progresses? What do you believe the consequences of not doing this might be for your customer relationships? And for your chances of retaining the contract at recompete? The customer will be planning for renewal (from the supplier perspective the recompete). Months prior to the official announcement, they will be starting option analysis, doing market research, and preparing their plans for recompeting the contract. Are you preparing for the recompetge months in advance, with a coherent and resourced plan? At least timed in line with your customer’s preparations? If not, you could find that decisions have been made about the scope, specification, and nature of the recompete that you have little time to prepare for. And less chance of influencing. Which could nullify a lot of your potential incumbent advantage. And put your chances of winning the recompete at risk.